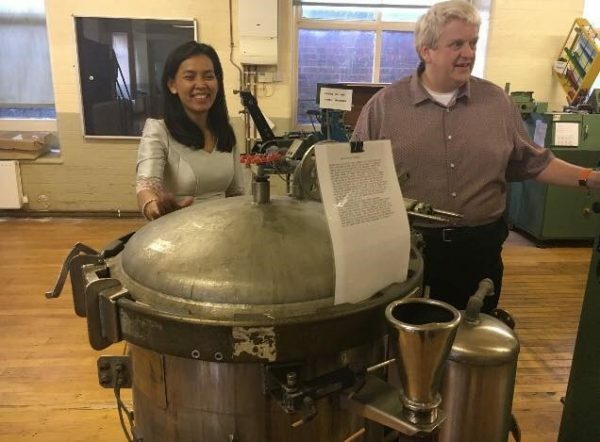 Anak, from Villageworks, was sponsored to visit Scotland in May 2018, as part of the World Fair Trade Day celebrations, and one of her trips was to visit Paisley Threadmill Museum. Villageworks uses Coats Thread and during a conversation with Stephen Clancy, about the history of Coats and their association with Paisley, Anak was shown some museum pieces that were being stored. One of these was the Dye Vat (in the picture) which was decommissioned when the mill closed. Anak mentioned that it was such a shame, as this would certainly have been of use to her as the artisans can only dye a small batch of thread at a time, as with hand dyeing it is difficult to maintain a consistency of colour. As Villageworks are producing the WFTO Fair Tartan accessories we joked that perhaps she could have it should it become available. By pure coincidence the museum had to relocate some of its ‘exhibits’ and Stephen contacted Fair Trade Scotland to see if sending it to Anak would be a viable option. Renfrewshire Council, as part of their commitment to fair trade, offered to arrange for the Dye Vat to be sent to Cambodia.